Based on a new poem by Andrew Hawes, the SATB choir, together with strings and harp, bring to life the calm and refreshing atmosphere of the Norfolk Broads and the elegant, majestic wherries of old. 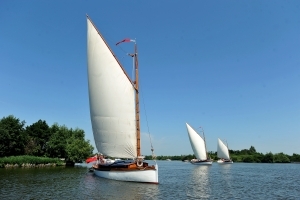 Commissioned to commemorate the centenary of the Wherry Yacht White Moth and premiered in Ranworth Church July 2015 with White Moth moored yards away. Who could tell all you see or know? And your burdens more refined. A boat was born from skill and dreams. Of ancient lines for purpose new. Or sugar beet in her wide hold. Was to be her own employ. And as a houseboat she was found. In gentle waves, her sail flung wide. Which in her lofty rigging sings. To run on you another day. To our century – she belongs.